Ed Mell, Ward Terrace Sunset, Oil on Linen, 20" x 28"
Ed Mell was born, studied art, and made his home in the West. Not surprisingly, Mell’s paintings evoke real emotion and reflect his own exposure to Western aesthetics over a lifetime; a viewpoint he shares fully with his admirers through his paintings. Expansive open spaces, Western inhabitants, and desert flora bring the West to life. Mell lets the viewer glimpse his world and by doing so allows us to experience his unique take on the West. Ed Mell, Brick Layer, Oil on Linen, 26" x 24"
The name Mell has become synonymous with the West, particularly the Southwestern landscape. Mell is no longer just the name of an artist but an adjective, describing a particular feeling or moment; a Mell sunset. The name Mell automatically conjures up images of distant mesas with glowing red clouds in a variety of shapes in the minds of those who understand his genius in capturing Mother Nature’s most beautiful moments on canvas. Mell’s reputation as a world-class artist is well known in the art world. What makes Mell special is not just the fact that he has had a major book done on his work, Beyond the Visible Terrain by Don Hagerty (an excellent read), but his humble attitude when it comes to his own work and reputation. If you’re lucky enough to visit with Ed at one of his gallery openings or museum shows, this will become quickly apparent. He is truly appreciative of those who buy his art and take the time to come and see one of his shows. He seems always to be amazed that year after year he has sold out shows. The demand for Mell’s painting and sculpture has not slowed. 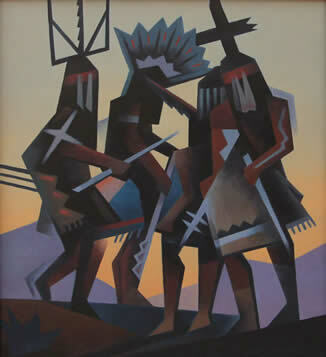 Even during a serious recession his collectors have continued to support their favorite Western artist. Ed Mell, Four Spirits II, Oil on Linen, 26" x 24"
After four decades of tireless dedication to enriching our lives through his artwork, Mell is being rewarded and recognized with a traveling museum retrospective and major gallery show that celebrates this Arizona native. Both museum exhibits and concurrent show at Medicine Man Gallery in Tucson, Arizona, will feature a diverse selection of some of Mell’s most recognized work, including dramatic landscapes of both modern bent and traditional form. On exhibit will be iconic images of the Grand Canyon, a subject for which Mell is well known. Mell’s book covers, posters, and public spaces. Many who visit the majestic canyon for the first time already have images of Mell’s paintings embedded in their subconscious. Other images to be exhibited include diverse inhabitants that are still Western. 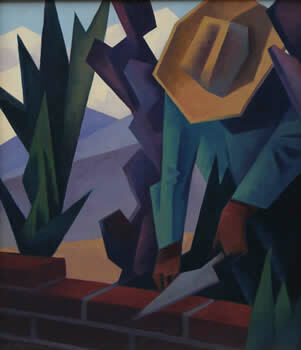 The Brick Layer depicts a seasoned worker plying his trade surrounded by native cactus. Four Spirits shows stylized Apache Gahn dancers contemplatively in motion. 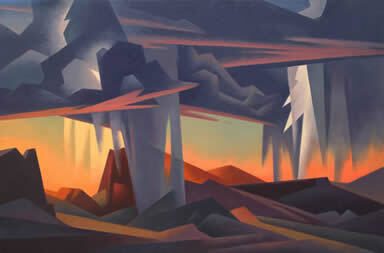 A remarkable monumental painting titled Storm's Downpour will be the featured piece at Medicine Man Gallery’s Ed Mell show. It’s a large dramatic landscape expressing the Southwest’s ongoing summer cycle of nature’s regenerating powers through rain and lightning. Ed Mell, Storm's Downpour, Oil on Linen, 32" x 48"
The events begin in Tucson with a museum member opening at the Tucson Museum of Art February 26, 2010, after which the show will run through May 23. 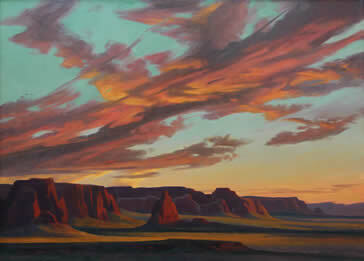 The following night, February 27, will be Ed Mell’s gallery opening featuring 20 new works at Medicine Man Gallery. The museum exhibit, featuring 40 works, leaves Tucson and will travel to the Museum of Northern Arizona in Flagstaff, then journey east to Georgia where it will be featured at the Booth Western Art Museum in Cartersville, Georgia. Those lucky enough to visit one of the museum openings over the next two years run will have the rare opportunity to truly see a Western original – Ed Mell. 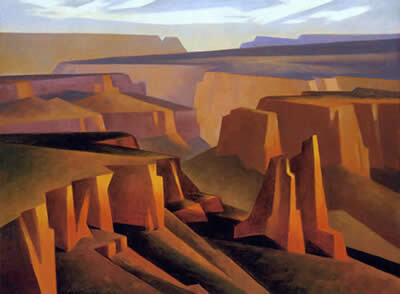 Ed Mell, Step Down Canyon, Oil on Linen, 18" x 24"